2017: 27th Feb. Losar, the Mandarava Druchen Retreat starts. Open webcast. 8:30-9:30am. We do Losar Delegs and have our breakfast. Then we offer our Losar presents. 10:00-10:30am. I give the Tridlung and instructions of the Mandarava practice. 10:30-12:00pm. We do the practice of Mandarava. 1:00-3:30pm. We have our lunch and then we play Bagchen and so on. 10:00-10:30am. I give an introduction to instructions on the Mandarava practice. 3:00-3:30pm. I give transmission of Ati Guru Yoga. 3:30-4:00pm. We do the practice of Mandarava with Chudlen pills. 10:00-10:30am. We do Sang and Serkyem. Put up all the new Lungtas. 10:30-12:00pm. We do the practice of Mandarava with Chudlen pills. 4:00-4:30pm. 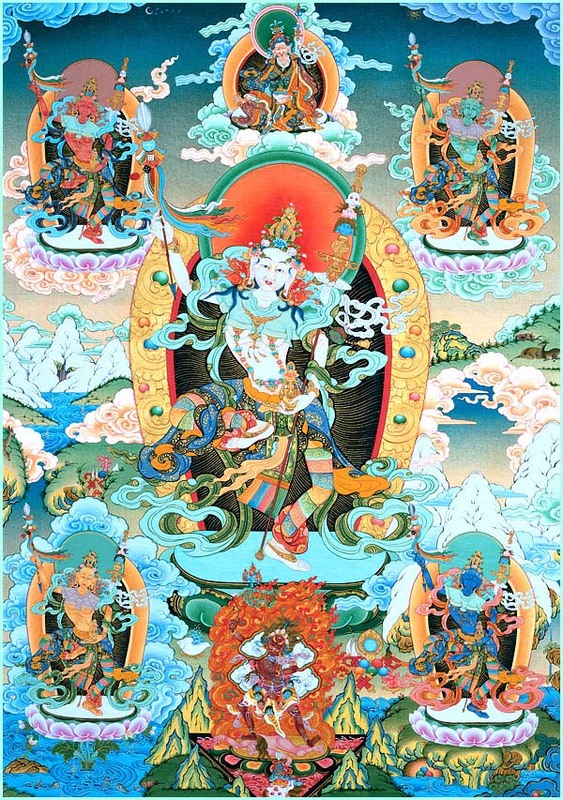 I give the tridlung of the root Mandarava text. 4:30-5:00pm. We do the practice of Mandarava. 10:00-10:30am. I give the tridlung of the Srog-thig text till the end. 4:00-4:30pm. I give the tridlung of the Srog-thig Lung-jyor. 4:30-5:00pm. We do the practice of Mandarava with Chudlen Pills. 10:00-10:30am. I give the tridlung of the Mandarava Tsa-lung text. 10:30-12:00pm. We do the practice of Mandarava with Chudlen pills and Srog-thig Lung-jyor. 4:00-4:30pm. I give an explanation about the 4 Initiations. 4:30-5:00pm. We do the practice of Mandarava with Chudlen Pills and Srog-thig Lung-jyor. 10:00-11:30am. I give a Long life initiation of Mandarava to those present. 11:30-12:00pm. We do the practice of Mandarava with Chudlen pills and Srog-thig Lung-jyor. with Chudlen Pills and Srog-thig Lung-jyor. 4:00-5:00pm. We do the practice of Mandarava with Chudlen Pills and Srog-thig Lung-jyor. 10:00-11:40am. We do the practice of Mandarava with Chudlen pills and Srog-thig Lung-jyor. 11:40-12:15pm. Presentation of the Dzamling Gar Gonpa project and so on. 10:00-12:00pm. We do the practice of Mandarava with Chudlen pills and Srog-thig Lung-jyor. 10:00-12:00pm. We do the Mandarava practice with Gana Puja for the day of Guru Rinpoche. 10:00-12:00pm. We do the Mandarava practice with its Srog-thig Lung-jyor 3 times. 3:00-4:00pm. We do the Mandarava practice with Chudlen pills and Srog-thig-Lung-jyor 3 times. 10:00-12:00pm. We do the Mandarava practice with Chudlen pills and Srog-thig-Lung-jyor 3 times. 3:00-4:00pm. We do the Mandarava practice with Chudlen pills and Srog-thig Lung-jyor 3 times. 10:00-12:00pm. We do the Mandarava practice with Chudlen pills and Srog-thig Lung-jyor 3 times. 3:30- 3:35am. I give the Lung of the Thun Book. 10:00-10:25am. I give the Lung of many collective practices and the root text of Mandarava. 10.25-12:00pm. We do the last Mandarava practice of this retreat with its Gana Puja. 12:00-1:30pm. Fundraising. I meet many people. This, roughly, is my teaching and practice program. Ahoj, pokud má někdo zájem o společné sledování pondělního webcastu, ozvěte se prosím na tel: 734 879 751. Prostor mohu poskytnout ve Starém Lískovci. Budu rád za společnost.